Our Sewickley Business District Spans from Blackburn Rd to just beyond Chestnut St.
North West of Downtown Pittsburgh, less than a 15 minute drive from Pittsburgh International Airport and South West from the Wexford/Cranberry area, it's easy to navigate using Rt. 79 and Ohio River Blvd. (Rt. 65). On street parking , the lots on both Division St. and Green St. are all public. Parking is FREE in the business district after 5:00p pm on weekdays and all ALL DAY Saturdays and Sundays. Monday-Friday use our convenient pay stations or download the mobile payment app, meter feeder. 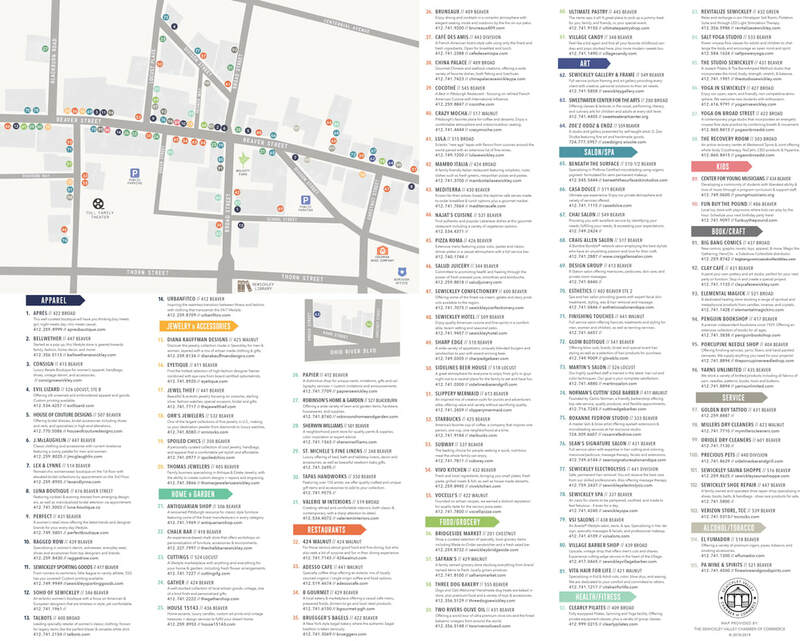 Below is the Sewickley business district's map of restaurants, shops and services open to the public. Business hours may vary.